Okay, I'm a bit of a crafty little devil. No, no not that kind. The kind that is obsessed with crafts, craft stores (love those 40% off coupons), craft books, craft magazines and yes, has her own room in the house dedicated to all my hobbies. And you can never have enough ideas... 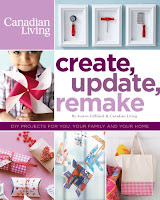 I subscribe to Canadian Living Magazine and I admit it - I always flip through to the crafts first, then go back and read the rest. 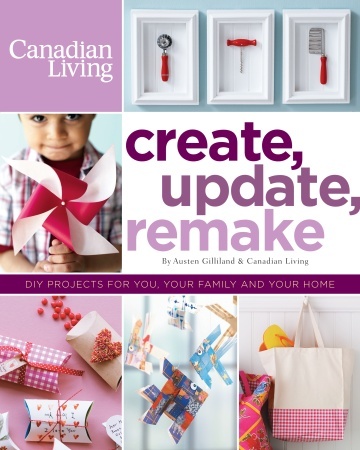 Well, Transcontinental has just released Create, Update, Remake edited by the staff of Canadian Living and there they are - 100 of their favourite crafts from the last ten years - all in one place! First thing to catch my eye was the cover shots. I have a whole collection of those retro kitchen gadgets (another hobby....) and love the idea of displaying them in white shadow boxes like this. Definitely going to copy this idea. The next chapter covers knitting and crocheting with clear, easy to read instructions for many ideas - socks anyone? I loved the Around the House chapter. Lots of great ideas here. One of my favourites was turning flea market glass sugar bowls into hanging garden lights. And I love the instructions for making your own garden stepping stones. I'm going to give that a go once the snow melts! Framed pressed flowers from the garden would make a nice grouping on my stairwell. Ever wonder how to upholster a chair - detailed how-to's are included. There's a great seasonal section as well, with lots of ideas for younger crafters. I've used the clothespin butterflies for a pre school craft at the library and it went over well. 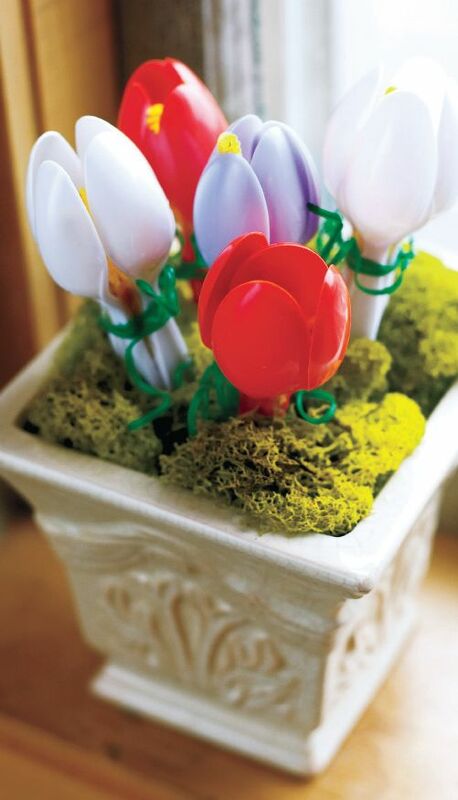 I loved the Spring craft - plastic spoons turned into crocuses. And the last chapter covers food and drink and inventive ways to package them as gifts. There are recipes for human treats, but I'm going to try the Classic Canine Cookies first. Patterns are included at the end. 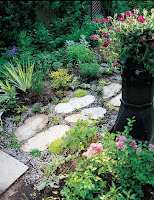 Each craft includes a full colour photograph. Lots of ideas and lots of fun for all ages and levels of craftateers! I find your blog quite interesting, I'm also quite the crafter and own 3 shops on Etsy where I sell eco-gifts and accessories, and vintage items. 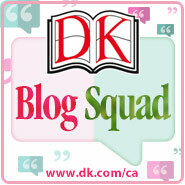 HOpe you ahve time to visit my book blog also. I love to look through books like this but have become less crafty as I've gotten older.